Katie Hess has been to every continent except South America. This month, she will travel to Peru to volunteer for jungle conservation work. Katie Hess has been to six of the seven continents. Next week, she’ll be checking the final landmass off her list when she travels to Peru for two and a half weeks. But rather than simply arrive as a tourist, Hess decided she wanted to make something more of her trip, so she started researching. After some digging, she came across International Volunteer HQ, an organization that offers inexpensive volunteering programs throughout the globe. 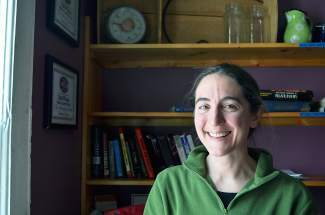 Hess spent her childhood in Concord, Mass., and attended Oberlin College in Ohio, where she double-majored in biology and environmental studies, with a minor in geology. Although the Amazon has long been on her to-visit list, Hess has taken a roundabout path to get there. She’s climbed mountains in Nepal and Mount Kilimanjaro in Africa. She traveled in Europe and for a while resided in New Zealand. “Living in New Zealand has definitely fulfilled a lot of my adventure desires, just because there’s so much to do,” she said. Hess has done a variety of jobs in Antarctica, most recently supervising remote polar field sites while based out of the South Pole Station in Amundsen-Scott. “I was originally a meteorologist and then I worked in communications,” she said. “I’m also an EMT, so I did volunteer trauma team. They trained me to be a firefighter one year.” She’s also spent time in Greenland as a site supervisor at a smaller camp. The southernmost continent definitely has a draw, Hess explained, although the experience can vary. For the most part, however, it’s a small and close-knit community, especially those who stay during the sunless winter months, when there may be as few as 40 people on base. Now, after 10 years of working with the United States Antarctic Program, Hess is ready to try something new. “I loved being down there, but I’m kind of looking for something else in life,” she said with a laugh. This winter is her second in Summit County, and she has a job lined up with the county as a 9-1-1 telecommunicator. Before it started, however, she wanted to get in one more trip. Research led her to International Volunteer HQ, which offered the chance she’d been waiting for — volunteer work in the Amazon jungle. Volunteers for the organization participate in projects throughout South America, Africa and Asia. The jobs include education such as language and health classes, construction work, conservation work, agricultural work and orphanage assistance. Next week, Hess and the other volunteers, one of which is a travel friend of hers, will meet in Cusco, Peru, and take a 10-hour bus ride to a remote area near the Manu National Park, which is a UNESCO World Heritage site. The volunteers will stay in two bungalows, without electricity, which can only be accessed by zipline across a river. Once settled, the volunteers will do a variety of conservation-related projects, which include trail maintenance, inventory and observation of wildlife, planting, organic gardening and cultivation of native plants. This speaks to the biologist in Hess. Although Hess doesn’t speak Spanish, she’s been studying up for her trip. The language barrier is just one of the challenges she knows she’ll face, but she’s excited all the same. “I really hope in our brief time there that we can actually contribute something worthwhile,” she said.